You can learn a variety of styles from classical to popular music. Whether you want to learn classical style or pop song, your teacher will be happy to help you become the pianist you want to be. You will learn the fundamentals of sight reading, technique and theory as well as your favorite tunes. You do not have to have a piano at home to take lessons. A simple full size electronic keyboard will suffice for the first 6 months. WHAT WILL I LEARN DURING MY PIANO LESSONS? ​A seven year old having their first violin lesson will have very different needs than a fifty seven year old taking up piano for the 2nd time after having had lessons as a child. 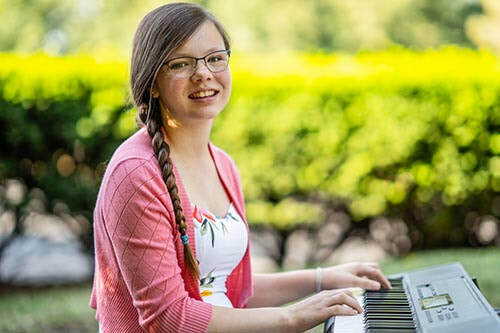 The main reason to choose the Westmont Academy as your music lesson provider, is that we are sensitive to the fact that every student is an individual. ​ARE YOUR PIANO INSTRUCTORS QUALIFIED? Our piano teachers have received their education from respectable institutions in the US such as Roosevelt University, De Paul University, Columbia College of Music, Judson University, University of Minnesota, and also in universities across the world. Some of our instructors have gone on performance tours of the US and Europe, all which have many years of professional performance and teaching experience. In addition to their teaching credentials, our teachers have warm personalities, are extremely friendly and strive to get to know each student and their parent on a personal level. Absolutely! Every January and June we provide recitals with Grand Steinway piano for our students to perform. There are no admission fees so you can invite as many family and friends as you want to attend the recital for free.